Paul Jacoulet was born in 1896 in Paris, but lived in Japan almost all his life. 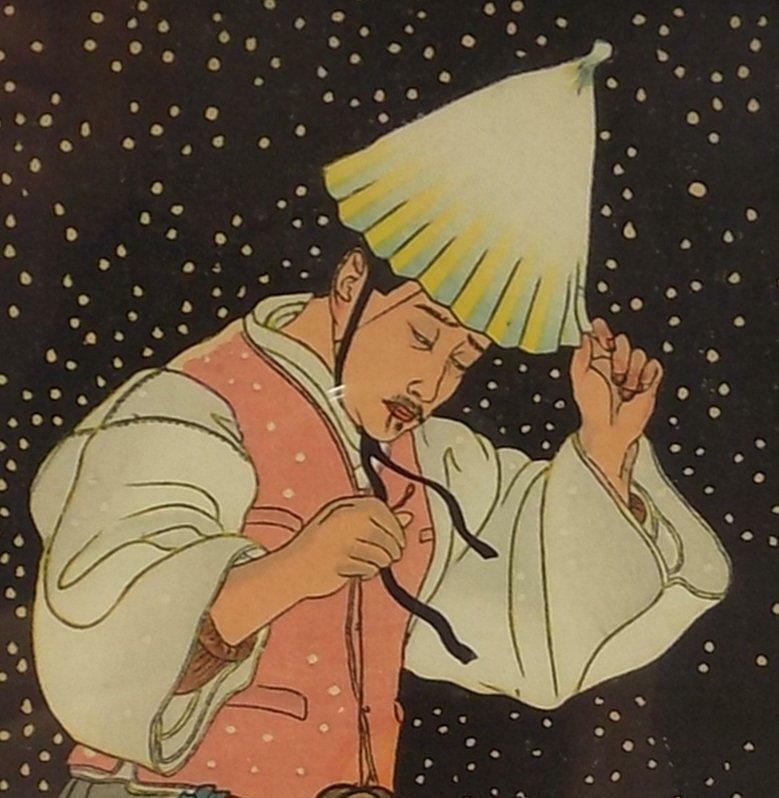 He was one of the few Westerners to master the art of woodblock printing, attaining respect in the art world, including Japan, for his complex designs and his printing techniques which combined traditional ukiyo-e ones and those he developed himself. Collectors of his artworks include Queen Elizabeth II, General Douglas MacArthur and Greta Garbo, among many others. We've included a photograph of the artist, looking very French in his dashing beret. 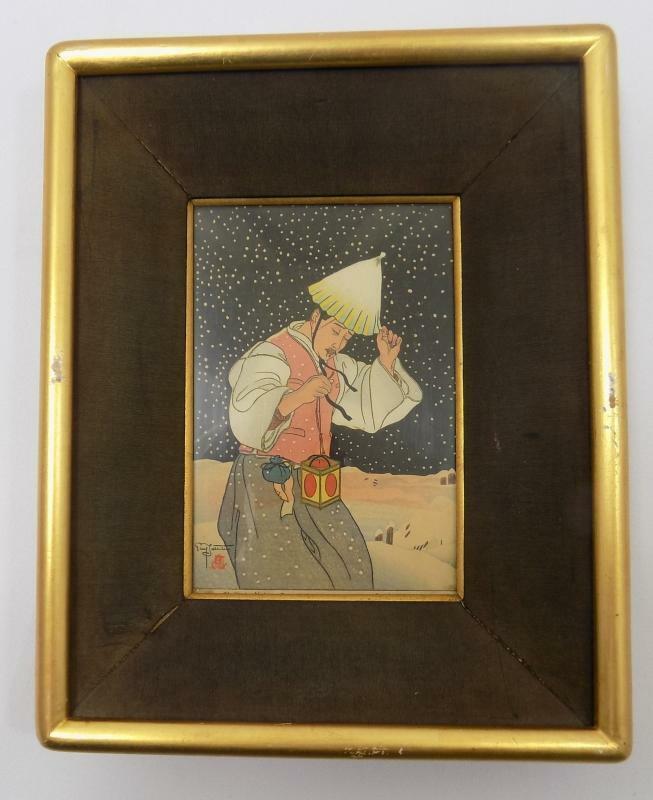 This woodblock print is entitled "Snowy Night, Korea" and is one of his more popular pre-World War II works. 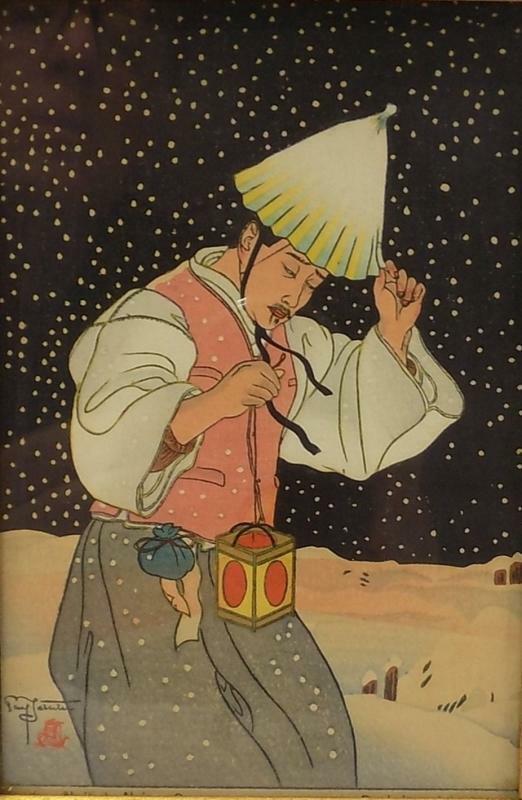 The falling snowflakes against the black sky, the man in his conical hat carrying a lantern against the night and treading snowy ground--all those elements come together to create a dramatic yet subtle scene. The size of the initial large print was 18 1/2 inches by 14 1/4 inches. 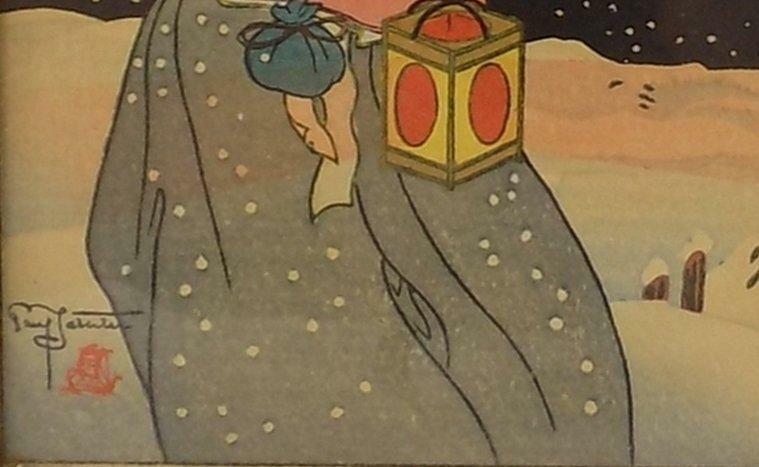 This edition is one of Jacoulet's Surimono** prints, which he issued both as smaller sized versions of some of his larger prints and also as original works. They were printed with the same number of blocks as the larger ones and were issued during the Christmas season. They are often called Jacoulet's "Christmas card prints" since he gave many as Christmas presents, while using the money from their sales to build houses for his woodblock carvers. in Yokohama. The surrounding paper is stamped with a date of December 9, 1957, probably brought to the US after the War as a souvenir or received as a gift, perhaps from Jacoulet himself. 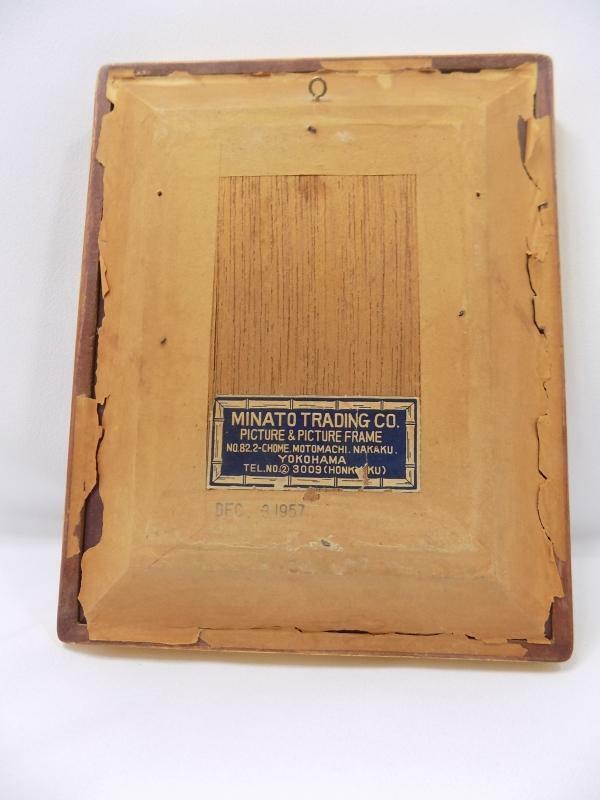 Although the backing paper is torn, there is chipping on the frame and the fabric is pulling away on the lower left corner, we have left everything intact for authenticity. The print has Paul Jacoulet's signature stamped lower left with his red boat seal stamped beneath. The gold fillet is obscuring the printed inscription at the bottom of the print, which reads "Nuit de Neige: Coree" (the title in French) on the left and "Paul Jacoulet" on the right. 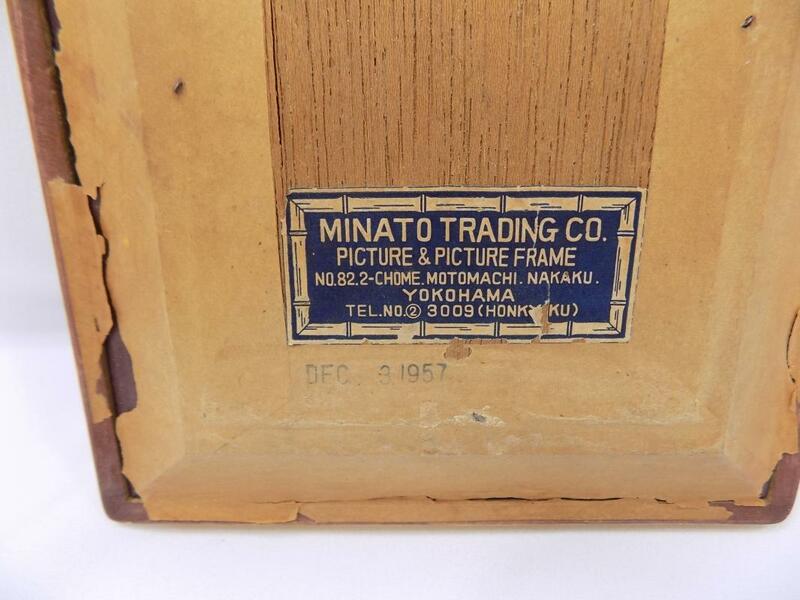 If we were ever going to have this reframed, we would preserve the date stamp and the Minato label and uncover the inscriptions at the bottom. 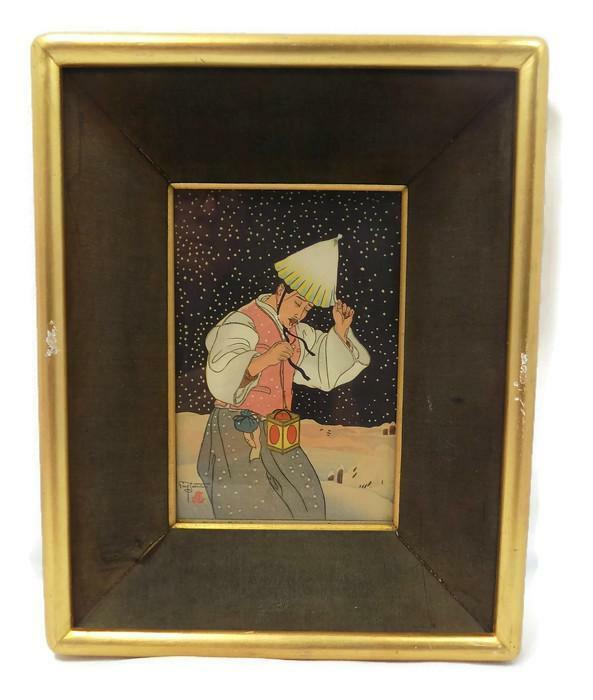 Highly collectible and desirable, this Paul Jacoulet woodblock print is a treasure. **Surimono is a Japanese woodblock print term that literally means "printed things." They are prints that are privately issued and distributed, usually produced in small numbers. They were often used as greeting cards or framed as gifts, as Paul Jacoulet used many of his Surimono.